As an individual with a disability, you do not need to put up with an employer's adverse actions taken against you because you are disabled. Both federal and state laws prohibit disability discrimination against employees, with California laws providing more protection. The Los Angeles disability discrimination lawyers at Gallenberg PC are dedicated to fighting for employees who have been victimized by mistreatment at their jobs. We offer a free confidential initial telephone intake to prospective clients. We also accept cases on a contingency fee basis. If you believe you were discriminated against because of a medical condition or disability at work, submit your case for review to an employment discrimination attorney at our law firm. 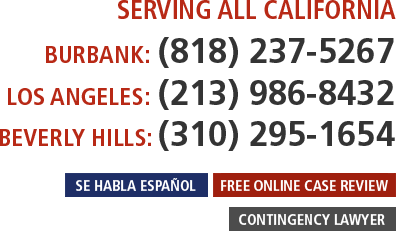 Call us in Burbank at (818) 237-5267, in Los Angeles at (213) 986-8432, or in Beverly Hills at (310) 295-1654 to discuss your case, or you can fill out our free quick and easy online form; this is the fastest way to get your case screened by an attorney. The Americans with Disabilities Act (ADA) prohibits disability discrimination in the workplace. If you believe you have been discriminated against based on a disability, you can file a charge with the Equal Employment Opportunity Commission (EEOC), and if appropriate, you can sue your employer for damages. In order to prove you were discriminated against based on a disability, you will need to prove that your mental or physical impairment is considered a disability under the ADA, you are qualified to perform all of the essential functions of your job without a reasonable accommodation, and your employer took an adverse action against you based on your disability. A mental or physical impairment is a disability under the ADA if it causes a substantial limitation on at least one major life activity. A court will look at the nature of the impairment, how long it lasts, and its long-term impact in determining whether the impairment qualifies as a disability. Under the ADA, a temporary impairment is not considered a disability if it does not affect major life activities over the long term. California's primary law against disability discrimination in the workplace is the Fair Employment and Housing Act (FEHA). If you have been discriminated against or harassed due to your disability, you can file a complaint with the Department of Fair Employment and Housing (DFEH). Both mental and physical disabilities are covered by FEHA, regardless of whether the conditions are disabling in the present. FEHA also covers medical conditions like cancer, but it does not include substance abuse disorders arising from the current illegal use of drugs. FEHA offers broader protections than the ADA. It covers California employers that have five or more employees. Moreover, a disability that qualifies under FEHA needs to limit a major life activity, but it does not need to be a substantial limitation. Both the ADA and FEHA require employers to provide reasonable accommodations for applicants and employees who are unable to perform essential functions of their jobs due to disabilities. Employers are supposed to engage in a good-faith interactive process to determine which accommodations may be appropriate. An employer must provide a reasonable accommodation unless to do so would present an undue hardship. Denying a disabled individual a reasonable accommodation may be a form of discrimination. However, courts do not consider it discrimination for an employer to refuse to hire someone who cannot perform essential job functions if there is no reasonable accommodation that would allow him or her to perform those essential functions. Similarly, when someone presents an imminent danger to him or herself or others on the job by doing the job, and there is no reasonable accommodation to reduce the danger, this is not considered discrimination by the courts. If you have been discriminated against as an individual with a disability or medical condition, you should enlist legal representation to assert your right to damages. At Gallenberg PC, our Los Angeles disability discrimination attorneys are experienced advocates who can fight for your rights. We represent people in Burbank, Beverly Hills, Pasadena, Santa Monica, Van Nuys, Glendale, Downey, and Inglewood, among other Southern California cities. Call us in Burbank at (818) 237-5267, in Los Angeles at (213) 986-8432, or in Beverly Hills at (310) 295-1654, or submit your case for review using our free online form. Gallenberg PC also represents people who need a workplace harassment attorney or guidance with another employment-related dispute.